Hearthstone's villains have united for Rise of Shadows and Shacknews continues breaks down each card leading up to its April release. Today, the Paladin meets Nozari! Analysis: Murlocs are hard to come by in the current Standard world and it's about to get a lot harder, because some good Murlocs are set to rotate out. 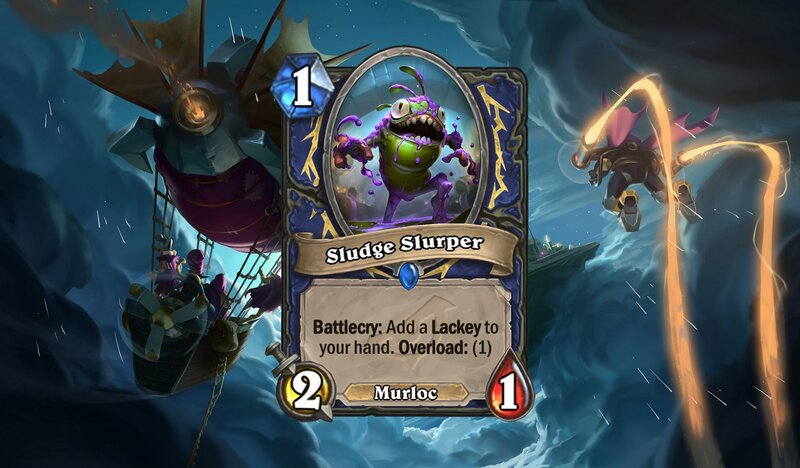 That's going to make Sludge Slurper stand out, largely because it won't do a lot of good in a Murloc Shaman deck. At least not right now. There's always a chance that things get better down the road, so maybe revisit this guy in a future expansion. As for Wild Murloc Shamans, feel free to go nuts with this guy. He's a solid Turn 2 or Turn 3 play after that opening Murloc Tidecaller. Choose One: Deal 2 damage to a minion or Restore 5 Health. Analysis: Jeffrey "Trump" Shih got two Druid cards to unveil and they work noticeably well together. Crystal Power is going to lend itself to a potential new Druid archetype: the Healing Druid. This will come in handy with the new Keeper Stelladris legendary, offering up a chance to deal damage and heal for a good amount. Simply casting one Crystal Power heal will be enough to activate the Crystal Stag effect. A 5-Cost 4/4 Rush isn't great, but how about two 4/4 Rush minions? Crystal Stag is a great value deal, both in constructed and Arena. If you're a Druid player running Keeper Stelladris and using spells like Mark of Nature, Crystal Stag could get buffed up to the point that it might have staying power in the late game. Crystal Stag won't be a Druid centerpiece, but it'll be a solid support minion. Whenever you draw a minion, summon a copy with Rush that dies at the end of turn. Analysis: Ooh, there's room for some shenanigans with this card. 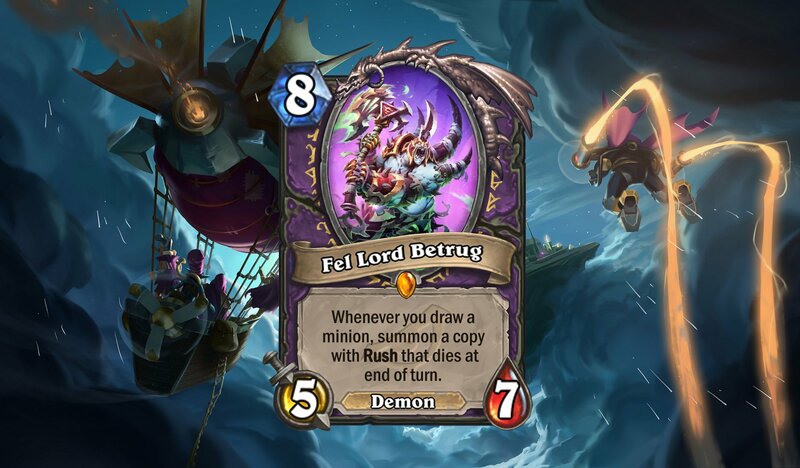 Fel Lord Betrug's effectiveness depends entirely on how many cards the Warlock is able to draw and whether the Warlock can specifically draw minions. The downside is that the opponent will know exactly what's in the player's deck and can prepare accordingly, but the benefits might far outweigh this drawback. Taunt. Battlecry: Your opponent summons a minion from their deck. Analysis: The Standard game has been missing something like this for quite some time. The Hecklebot is what's known as the C-C-C-C-C-COMBO BREAKER! If you're a Combo Priest, a Malygos Rogue, or a Mecha'thun anything, then the Hecklebot is here to potentially ruin your day with the snap of its mechanical fingers. The idea is that it pulls out your game-winning combo piece out and gets it off the board before the opponent can hit you with the OTK whammy. The Hecklebot will work beautifully with classes that have instant removal at the ready. Think of the Rogue player with Walk the Plank or the Control Warrior with Shield Slam. And if by chance it pulls something a little lesser out, then it can simply ward it off with its 3/8 Taunt body. Hecklebot will also prove to be a high-value pull from Dr. Boom, Mad Genius and his Discover effect, especially in the late game when both decks start approaching fatigue. 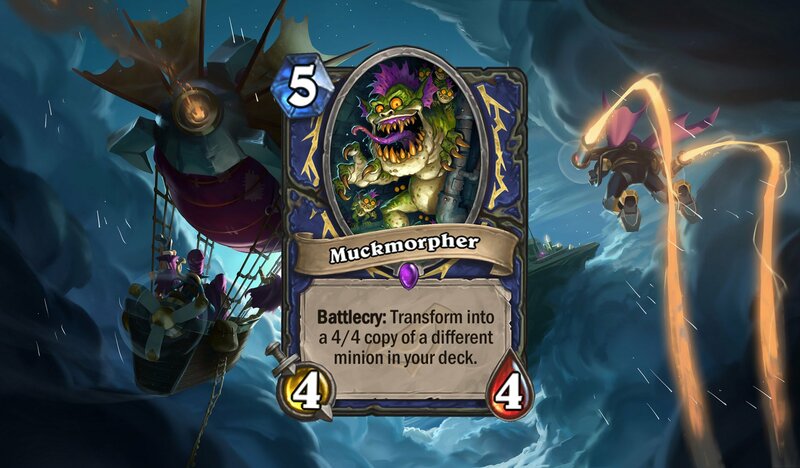 Analysis: Muckmorpher is an interesting animal, in that there's almost no control over which minion it copies. It could be that 4/4 Malygos or 4/4 Al'Akir the Windlord you're craving. Even a 4/4 Witch's Apprentice or 4/4 Mana Tide Totem can come in handy. But it could also just as easily be a vanilla 4/4, which isn't great. What you'll ultimately want to ask yourself is whether you'll have the right minions in your deck to make this pay off. And will this be a better play than Faceless Manipulator? The jury is very much out on Muckmorpher. It can have its uses, but it definitely won't be a high-tier Shaman card. Analysis: Oh snap, this could be downright fearsome in certain Shaman decks. With Healing Rain about to rotate out, the Shaman's healing options are seeing a big reduction in the new Standard. But Walking Fountain has the potential to bring the Shaman player back from the brink in the late game, while also reducing some of the opponent's minion ranks. Walking Fountain will certainly be a nightmare in Elemental Shaman decks, especially if it comes off a random pull from something like Menacing Nimbus. Combine this guy with Earthen Might and you'll get maximum value and a 6/10 with Rush and Windfury that can do some heavy damage and some heavy healing. This will almost certainly be a popular guy in Arena and will be a tough minion to remove. It's a greater Stormwatcher in every way. Analysis: I probably haven't made it much of a secret (no pun intended) that I don't think highly of Paladin Secrets. Outside of that cup of coffee that they had during the Grand Tournament, they haven't been real game changers. I'm not expecting that to change with Commander Rhyssa, largely because certain Paladin Secrets would be redundant to trigger twice. You can't give a minion two Divine Shields, for example. You can't reduce an opposing minion's Health to 1 twice. The only useful Standard tool here would be Redemption. Wild players will get much more use out of this card, simply because of the better options available there. Getaway Kodo and Avenge will be the greatest beneficiary of Rhyssa's ability. The problem is going to be keeping Rhyssa alive, because a 4/3 can be easily removed, even in the early game. Maybe Redemption keeps her alive, but it's a big risk. Twinspell: Freeze a minion. If it's already Frozen, deal 2 damage to it. Analysis: This is an interesting introduction to the Twinspell mechanic, which offers up some utility uses. Mage players can use this to either freeze high-value targets on back-to-back turns, use it to freeze two targets on a single turn, or combine it with other freeze spells to do some damage to certain targets on the brink of elimination. 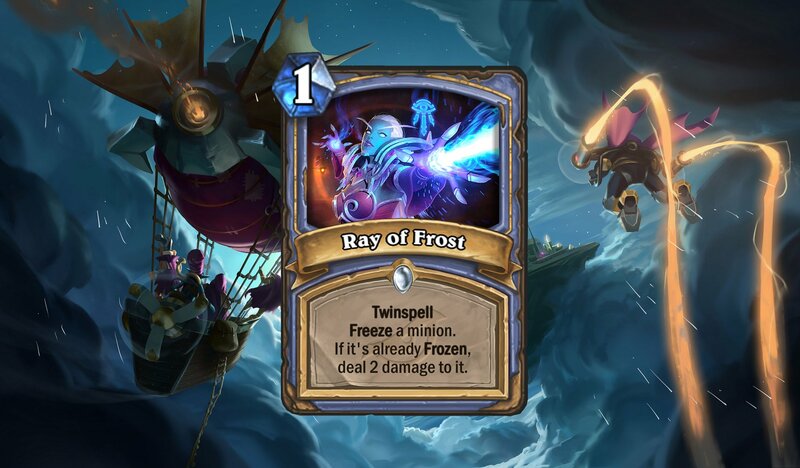 I wouldn't expect Ray of Frost to get packed into many constructed Mage decks, but I would imagine that it will be a valuable pickup from a random effect. It'll also find its way into more than a couple of Arena decks. Analysis: Before going any further, can I just take a moment to give a round of applause to DisguisedToast for this reveal? Toast: "I'm very big-brained, so no puzzle can hold me." Just like in Hearthstone, aggro proves to be effective. Alright, so let's look at the Mana Cyclone. On the surface, it looks like a Turn 2 play. Its effect says otherwise. This is something that gets played alongside something like Blizzard, Frost Nova, or maybe even that Ray of Frost spell from earlier. Mana Cyclone has potential to offer up some high value, which will come in handy in certain constructed decks. In terms of generating random spells, it goes well with Blast Wave. Unfortunately, Leyline Manipulator is about to rotate out and that's where the random spell generation idea gets hurt a lot. But I'd certainly expect to see Mana Cyclone pop up a lot in a Wild Elemental Mage deck, with Leyline Manipulator helping out a lot. 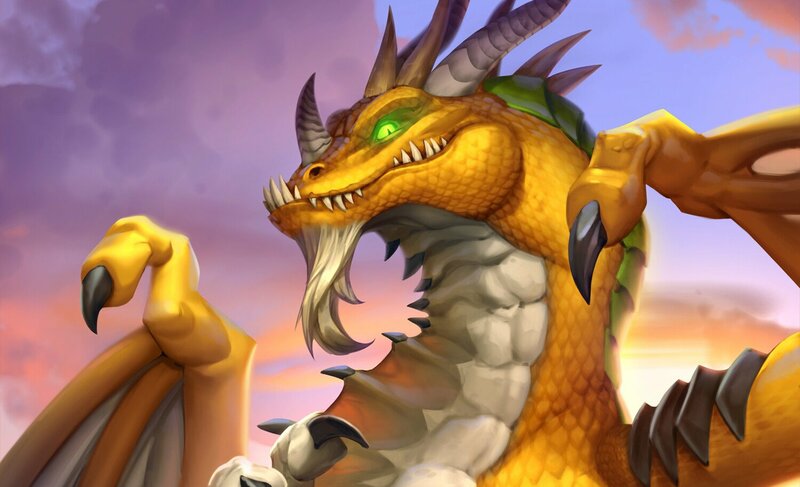 Analysis: The Healadin deck is taken to its most extreme with this emergency dragon. 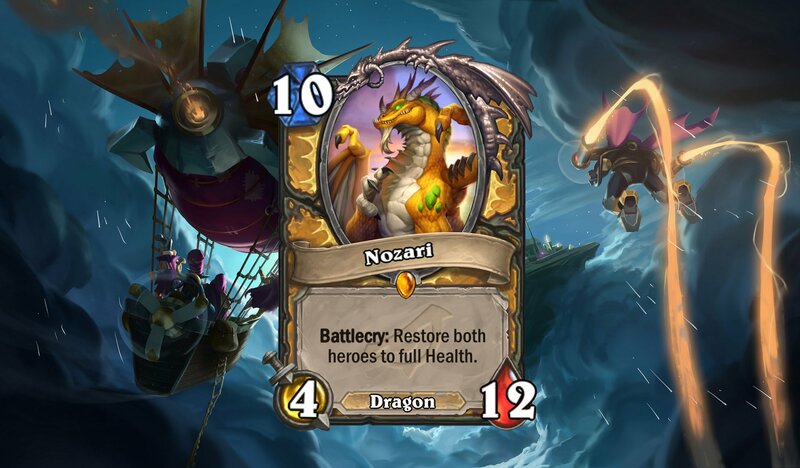 Nozari can return both players to full Health, but it can ultimately be the Paladin who benefits most if they're running a deck with High Priest Thekal and Shirvallah, the Tiger. Nozari's 4/12 stats aren't bad, but there's always a chance to enhance them when using the new Dragon Speaker minion. Dragon Speaker can buff this guy to 7/15, meaning that while both players will be returned to full health, the opponent will be facing down a pretty large dragon. Just make sure the board is relatively cleared before dropping Nozari down. Returning to 30 Health is no good when facing down a board full of minions who can just cut that 30 down to zero in a single turn. Battlecry: Your opponent casts a spell from their hand (targets chosen randomly). Analysis: Here's a completely different kind of C-C-C-C-C-COMBO BREAKER minion. Rather than pull out an opponent's essential combo piece minion, it potentially pulls out the opponent's essential combo piece spell. Unlike Hecklebot, Unseen Saboteur has a greater chance to backfire. It's possible to pull something out like Blizzard, which will completely debilitate your board before handing off to the opponent for their next turn. It could also pull out a spell that fills their board with minions or completely buff their board. Yes, it's theoretically possible to wipe out opponent win conditions by yanking out something like Mind Blast, Savage Roar, Pyroblast, or Bloodlust. But it's a very risky play with a much higher potential to leave you giving the opponent a free Mind Control or the like.